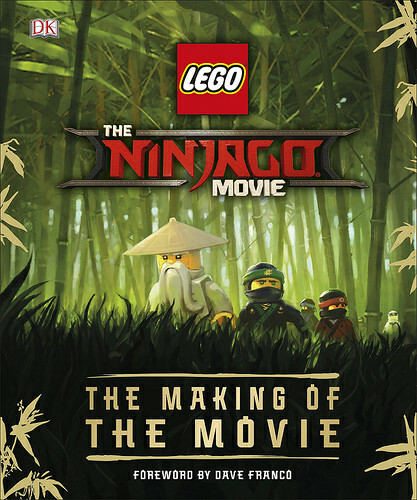 The Ninjago Movie: The Making of the Movieis yet another Lego theme book published by DK and this one follow six months after the release of The Lego Batman Movie: The Making of the Movie. If you are the kind that keeps tab on entertainment news, you should know by now that The Lego Ninjago Movie didn’t perform as well as the other two Lego movies. Critics call the story predictable and humour pretty underwhelming though many agree it’s good enough for the younger kids. Even our very own reviewer loves the movie. But no matter how bad the movie is, you can’t deny the hardwork put in by the trio of creative forces that ranged from Animal Logic in Australia, Warner Bros studio in LA to the Lego Group in Denmark. This 199 pages hardcover book covers mostly the design aspects of it and similar to the Batman book, is spilt into three major sections- Locations, Characters and Vehicles. Locations touches on the crazy Lego metropolis with its mixture of old-school charm and out-of-this-world skyscrapers. The book showcases numerous concept arts and screenshots which I’m sure is fascinating enough for fans to browse through. There are also pages devoted to the quirky Ninjago language, shop stalls, city signage and Lord Garmadon’s volcanic lair. Lastly, we are treated to more concept arts that were never used in the movie’s final cut. The next chapter, Characters delve on the design of the movie’s main characters from the members of the secret ninja force to Master Wu to the Shark Army to the even the ordinary Ninjago city citizens. Again, the last few pages of this particular chapter also contains designs of many fun characters that never made into the final movie liked the appearances of bounty hunters. Last of all which is a favourite among Lego toy collectors is an entire chapter dedicated to the different madcap vehicles seen in the movie and toy stores. From Llyod’s Green Dragon to Kai’s Fire Mech to Jay’s Lightning Jet Mech and more. In addition, the book contains ancedotes from the various filmmakers such as director Charlie Bean, producer Dan Lin, a foreword by voice actor Dave Franco and you also get to know why the movie opted to incorporate natural objects and environments instead of making everything brick-style. The Ninjago Movie: The Making of the Movie is an easy to follow book for younger fans and a rather fun read for the adults. Unfortunately, if you are looking for something that delves deeper into the production process then this is not the book for you.